In 2012, Superstorm Sandy brought New York City a 14-foot storm surge, the largest in nearly two centuries. High water and strong winds wreaked havoc on the region; damage estimates for New York State alone totaled almost $42 billion. 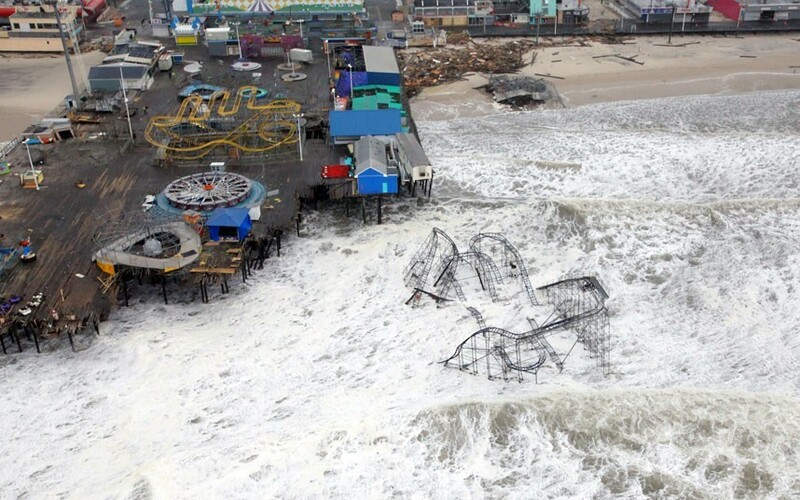 Sandy’s devastating economic and human impacts drove substantial media coverage of the relationship between anthropogenic climate change and hurricanes, as the public asked questions about preventative urban planning and emergency preparedness for future events. The media attention provided an opportunity for scientists to communicate with the public. Numerous researchers, including Adam Sobel of the Lamont-Doherty Earth Observatory, stepped up to explain the science behind hurricane forecasts and projections for future hurricane frequency and strength. 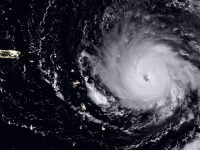 The emerging consensus among scientists is that as climate warms, the frequency of the strongest hurricanes is likely to increase. However, there are still many unknowns, including what that frequency will be, how different areas might be affected, and how the frequency of less intense hurricanes might change. One reason for this uncertainty is the scarcity of hurricane observations prior to the 19th century. Because we know little about hurricane behavior during periods when Earth was warmer or colder than at present, it’s challenging to construct models to predict future trends in hurricane activity as Earth’s climate changes. To remedy this problem, researchers have been working to reconstruct records of hurricane strikes in the past. This technique, termed paleotempestology, uses geological principles to identify hurricane strikes in the sedimentological record and place them in time. Hurricanes making landfall can cause substantial changes in the sediments deposited in inland basins. Typically, these basins are accumulating terrestrial material—usually fine-grained, organic-rich sediments. 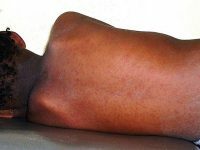 During a storm surge event, coarse, sandy marine sediments—such as beach sands—may be suspended by waves and carried landward into these basins. When the storm water retreats, normal sedimentation resumes and these “storm layers” are preserved, sandwiched between terrestrial sediments. Paleotempestologists take sediment cores in these basins, identify layers of different sediment character and relate them to the climate at the time of deposition, providing valuable information for understanding past storm activity. Before departing for the Bahamas, we used satellite imagery to identify several inland lakes on Exuma that might contain layers representing past hurricane strikes. We looked for basins that are normally dominated by terrestrial sedimentation, but exist in areas that are sensitive to storm surges and are likely to have changes in sediment type (to coarser, marine sediments) during those events. 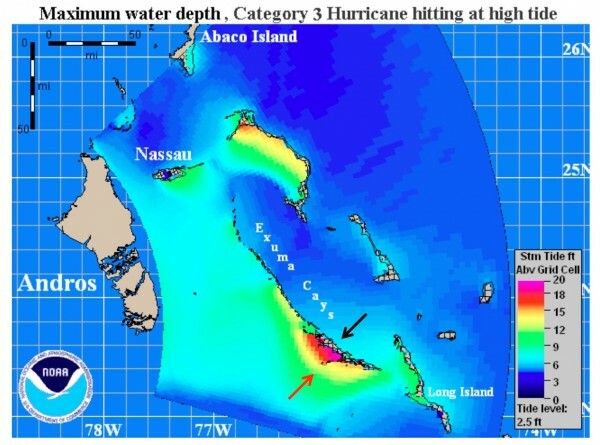 One promising site was an inland lake separated from Sand Dollar Beach by a dune ridge that would likely be breached by a storm surge of 4 meters, which could result from a direct hurricane strike on Exuma. 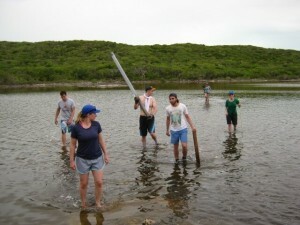 We visited Sand Dollar Beach and retrieved two sediment cores from the shallow, freshwater lake behind the beach dunes. The longer of the two cores was about 4 feet and contained three layers that were lithologically distinct from the rest of the core. These three layers were composed of coarse shell hash with less of the finer ooid sand that dominated the rest of the core. Because the coarse material is heavier and more difficult to suspend and move laterally, it is likely that they represent high-energy deposition events. These are exactly the kinds of depositional layers that are typically associated with storm surges and hurricanes. More detailed analyses and layer dating are required to place these events in time and associate them with individual storm or hurricane events. Nonetheless, a second sediment core from the same site also contained layers of shell hash, suggesting that the event history is reproducible. With these initial results, the area behind Sand Dollar Beach may represent one target for a larger investigation into past hurricane activity in Exuma. Mangrove swamps are also a promising environment for reconstructing hurricane activity. These low-energy tidal environments are typically dominated by organic-rich, estuarine deposits, but during high-energy events, water carrying significant amounts of sand can flood the mangroves and leave behind coarse inorganic sediment layers. 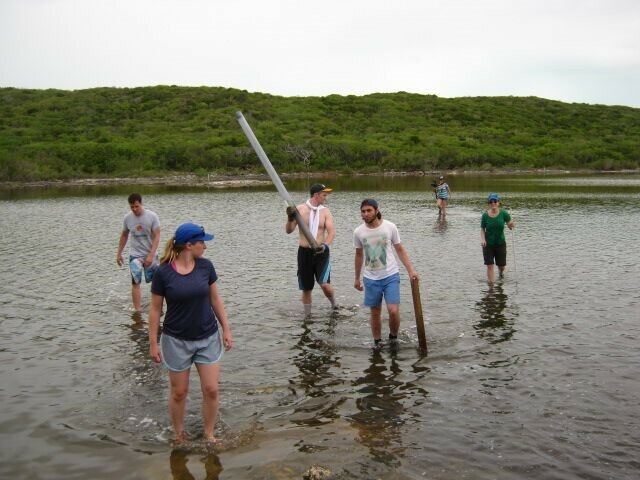 We selected a mangrove swamp on the southwest side of Exuma for coring, in part because storm surges on that side of the island are typically higher than on the northern edge. This is because storm surges are funneled into two “nooks” on the south side of the island, amplifying their height. Our coring in the Moss Town mangrove swamp was one of the highlights of our trip so far. Not only did we get to observe red mangroves and their associated flora and fauna (including a lemon shark), we also collected an exciting sediment record. The core was relatively short—just 13 inches in length—but was the most compositionally diverse of all the cores we’ve collected thus far. At the base of the core was an organic-rich layer consisting of a dense network of fine, reddish roots, probably representative of mangrove-dominated peat sedimentation. Above that interval was a layer of gastropod shell hash grading up into a fine, carbonate-rich mud. This kind of “fining upwards” sequence is characteristic of high-energy events where sediment from the shelf is ripped up and mixed during transport inland. As the energy dissipates, the coarsest and heaviest sediment settles out first, followed by finer sediments, until the water column is once again inorganic sediment-free and the previous sedimentation regime resumes. Because the core extended down to the underlying beach rock and contained only one high-energy, fining upwards event, we suspect that the estuary records the most recent storm event to strike Exuma, probably Hurricane Irene. Previous deposits were likely removed by erosion during dry intervals or scouring just prior to the deposition of the most recent sediment package. Consequently, this part of the Moss Town mangrove swamp may not be ideal for reconstructing long records of storm activity. 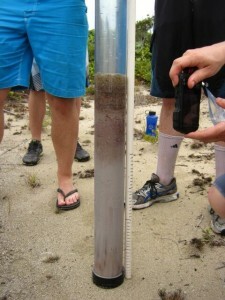 Nonetheless, when associated with information about Hurricane Irene, this sediment core can provide important insight into modern depositional processes, which can be used to draw inferences about older sediment packages of similar character. Selecting an area to collect sediment records for paleotempestological reconstructions is a challenging balance between identifying sites with sufficient accommodation space to preserve long records and prioritizing areas with high sedimentation rates that are sensitive to storm surges. The two areas we cored probably represent the end members of these criteria, and we have not yet identified a basin that contains a long record of storm events at high resolution. However, the abundance of inland lakes, mangrove swamps and sinkholes on Exuma suggests that an ideal environment for sedimentary preservation does exist. 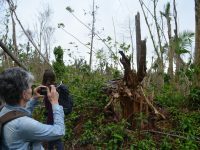 One possibility is that an area of the Moss Town mangrove swamp, farther from shore, may have sufficient accommodation space to preserve a longer record of past hurricane strikes. The only solution is to continue our search for a goldilocks site! 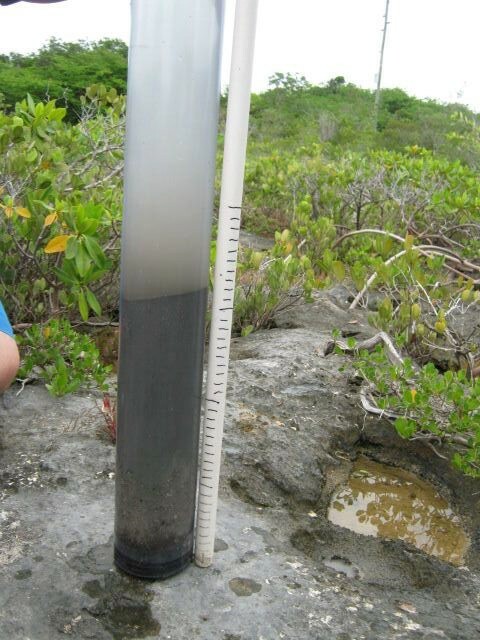 Allison Jacobel is among a group of nine students from the Department of Earth and Environmental Sciences at Columbia University spending a week in Exuma, The Bahamas, looking for evidence of past hurricanes. The work is supported by the Extreme Weather and Climate Initiative, Lamont supporter Frank Gumper and other sources.